1996 Bontrager Privateer - AKA I finally managed to get one. All stripped down now. It came apart easily and happily the stem looks completely unmarked. 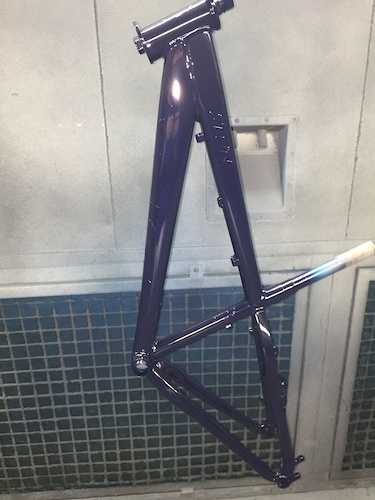 The frame has a few big chunks out of it - on the down tube and and the chainstay so its definitely getting painted. Need to decide between KTM orange or a trying to get a metallic dark blue - RAL 5004 looks like a close match for the original. Some differences on the privateer - the brake studs and drop outs I already knew about but didn't realise that there are no gussets on the chainstays of the privateer - unlike the race and race lite. It does have the top and down tube gussets though so it is at a least a little bit authentic. Also, bontragers seem to be like buses - none for ages and then three come along at once - in the course of tracking down a seatpost I nearly ended up buying a race lite as well. Last edited by slackboy on Fri Nov 02, 2018 7:06 pm, edited 1 time in total. I was going to clean up the BCX-3 wheels and re-use them. But having compared them to some Mavic 221's that I have they are a lot heavier (front is 100g more without a skewer) so I'll probably use the Mavic's instead. Also have some cheapo WTB Velociraptors on the way from Planet X but will more likely get some Smoke & Darts in the future. Post subject: Re: 1996 Bontrager Privateer - AKA I finally managed to get one. I have indeed seen excellent orange Privateers. It’s a great colourway. But COTIC have kindof occupied it now. And I always think Oranges should be orange - since the first Tushinghams were white-orange fade. My RACELITE OR is the nice deep purple and I have a real soft spot for that. Looks black.....but when you get up close....it’s purple. And that’s nice. But COTIC have kindof occupied it now. I saw that - lucky kid. I keep thinking of getting an XS cotic for my girlfriend - but at 5' nothing it would probably be too big for her anyway. Actually I am not so sure. Alex (RGrom) is 5 2 and he’s on a small with the saddle on an in-line post (the temperamental but light Cranks Cobalt 3) and a 40mm stem - and the whole thing is just slightly too big but only by a smidge. He was on an XS Orange P7 with 24 inch wheel and then 26 inch, and that fitted him brilliantly ... but i think the COTIC is fine and in one month will be perfect. I would say that Cy recommends on the small size in respect of the Soul 26 chart - I am 5 7 and the small is ... too small. I would say an XS would fit your partner well, and you could put 24 wheels on it as an option but I don’t think that would be necessary. A weekend of hunting down parts. Got a silver thomson seatpost and some WTB velociraptors incoming. Trying to source a 1" steerer for my pace fork along with a 1 1/8 to 1" shim. Off on hols next week so the paintwork will have to wait until I'm back.